Christmas lights, a Pack'n Play, and a cardboard castle. These are the things that I see from my bed every night. The black and gold clock on the wall was a wedding gift to my parents from my mammaw Maxine Shepherd. I am struck by the realization that it now measures our days and how her presence watches over our little family. Sterling is in her crib as I type and I can hear the steady rise and fall of her breathing through tiny stuffy nostrils. Today was a tough day for her as she battled chills and a 102 degree fever. Even sickness could not dampen her smile and her spirit. The playpen in the center of the picture held her brother Caleb, her sister Aleksandra, and now her. Well, honestly it has never held her... she easily climbs out. A year ago tonight... we didn't even know her name. We were over 5 years into a process that seemed never-ending. We endured delay after disappointing delay. Tonight she struggles to sleep, tossing restlessly as my wakeful sleep listens to her breath. The night shatters with the sound of her crying out and she then is lifted into the comforting embrace of me her father, or Kellie her mother. We hold her close as her head rests on our shoulder and the cry calms back to soothing breath. Sterling Mei Shepherd oh how you have changed our lives forever. You have reminded us what it means to love, to feel compassion, to find joy, to reconnect with the important parts of living. You remind me to cry out to my God and to be surrounded in His embrace. It is no mistake that we find ourselves with you, my daughter Sterling at this point in our life. You are here to show us the way... we are to approach our God the way you reach to us. A year ago we didn't even know your name. And here we are tonight, convinced you have been with us forever... and you point us the way forward as you fit so neatly into the past that has brought us this far. 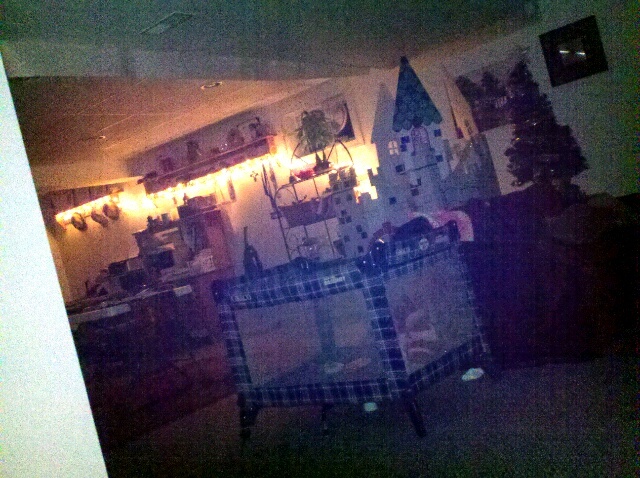 And so now you again rest in your bed as I type in the glow of Christmas lights eclipsing a cardboard castle. I close my eyes in the embrace of my God and in the glow of childhood wonder. Yes... this is where I belong. 185 days to our arrival in Guatemala. Thankful. Excited. Ready. A year from now... I will see farther. Safe in My Father's Arms on a Toolbox.